Researchers are only starting to examine how orthotic management affects foot and ankle kinematics in patients with posterior tibial tendon dysfunction. The surprising findings could change your approach to PTTD. Central to both conservative care and surgical procedures are the foot kinematics that occur before and after these treatments.12,13 Current theoretical approaches to PTTD propose that abnormal foot posture is prognostic. For example, subjects with tendinopathy and flexible foot deformity are categorized as having more severe PTTD (stage II) than subjects with tendinopathy without deformity (stage I).14-16 Further, those subjects with tendinopathy and fixed foot deformity (stage III) are considered more severe than those with flexible deformity.14-16 Until recently, the manner in which foot deformities in subjects with PTTD manifest during functional tasks like walking and heel raises has not been explored. In an effort to test foot movement, several multisegment foot models have been introduced (Figure 1).17-22 Many appear sensitive for abnormal foot kinematics in a variety of subjects like PTTD, despite using contrasting methods.20,23-27 Studies comparing bone-mounted markers and surface markers28,29 suggest errors lower than differences expected in subjects with gross foot pathology like PTTD. To align segment coordinate systems, some studies use radiographs,12,25 others employ a jig,30 and recently the subtalar neutral (STN) position has been used.17 The STN or a jig appear reliable and do not require radiographic exposure.17,30 The foot angles defined using a STN or jig based positions differ from radiographically defined angles used clinically. Although the range of foot deformity varies, the clinical description of abnormal foot posture in subjects with PTTD includes significant alterations in the medial foot joints (talonavicular, medial cuneiform 1st metatarsal) leading to a lower medial longitudinal arch (MLA).4,11,16,31 A description of the MLA derived from a multi-segment foot model may have some utility for tracking disease progression and contributing to a new understanding of foot biomechanics.23,26 These results are applicable to the design of braces/orthotics, rehabilitation and surgical reconstruction. The purpose of this review is to discuss the results of recent studies that examine the in-vivo kinematics of foot movement in subjects with PTTD during walking and heel raises. Alterations in foot kinematics associated with PTTD may arise from 1) alterations of the posterior tibial tendon and leg muscles, 2) decreased ligamentous support, and 3) abnormal foot kinematics. 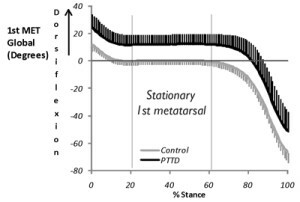 Muscle and ligament changes associated with PTTD are thought to be associated with abnormal foot kinematics that occur during walking and heel raises. Clinically, foot kinematic models are being used to improve rehabilitation programs and brace designs for treatment of PTTD. Posterior tibial tendon dysfunction primarily occurs in the tendon distal to the medial malleoli, however, atrophy of the muscle belly may occur proximally.32-34 Studies using imaging and others taking specimens at the time of surgery document that posterior tibial tendon dysfunction (PTTD) is a tendinopathy that occurs between the insertion on the navicular/cuneiform distally and proximally where the tendon wraps around the medial malleoli.32-34 The nature of the tendinopathy varies from enlargement and discoloration to tears that run the length of the tendon.32-34 The link between these changes in the tendon and muscle weakness is not clear; however, through disuse or neural mechanisms associated with pain, the posterior tibial muscle may atrophy (Figure 2). Changes in tendon structure may lead to changes in the stiffness of the tendon, resulting in greater compliance. However, theories related to tendon compliance are poorly understood and not prevalent in clinical models of care. It is probable that alterations in tendon compliance alter the mechanical role of the muscle and interact with the muscle responses. Physiologic cross sectional area (PCSA), moment arm and task specificity are three factors that may contribute to the association between PTTD and foot function. Note that the PCSA of a muscle is a key morphologic measure that reflects the muscle’s ability to produce force. Of the deep compartment muscles (flexor digitorum longus, flexor hallucis longus, and posterior tibialis) the posterior tibialis muscle accounts for 60 % of the PCSA, suggesting it has the largest capacity for force output among these synergists (Table 1). A study of subjects with PTTD just prior to surgery (after an average of 40 months of failed treatment) documented fatty infiltration in 3 of 12 posterior tibialis muscles and deficits in muscle volume of 2% to 17 % compared to the uninvolved side.35 This same study documented hypertrophy of the FDL muscle. However, because the PCSA of the FDL is so small (Table 1), the effect of this adaptation is unlikely to compensate for the atrophy of the posterior tibialis muscle. This study supports the influence of PTTD on muscle volume, and hence, PCSA (hypertrophy/atrophy). Cadaver studies suggest the posterior tibialis muscle has the largest moment arm of the deep compartment muscles for subtalar inversion and forefoot adduction.36,37 The ability of the posterior tibialis muscle to raise the medial longitudinal arch also has been noted in several studies.36,38,39 However, the ability of the posterior tibialis muscle to plantar flex the first metatarsal joint may be secondary to its role in inverting the subtalar joint and adducting the forefoot.36 Clinically, this suggests that muscle testing and exercise directed at the posterior tibialis muscle should include hindfoot inversion and forefoot adduction. Unexplored in current studies is the role of the peroneus longus muscle. The peroneus longus muscle is a hindfoot everter at the subtalar joint. However, the peroneus longus muscle may act as a 1st metatarsal plantar flexor. Some studies43 and anecdotal observations using potted, non-weight bearing, cadaver limbs in our laboratory support the role of the peroneal longus as a 1st metatarsal plantar flexor. 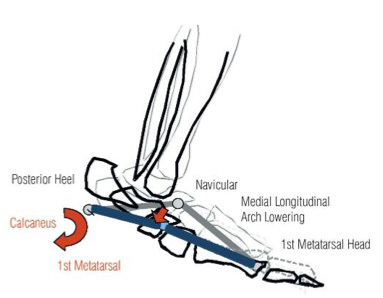 However, no current studies sufficiently document the effect of the peroneus longus muscle on the 1st metatarsal. It is unclear from current studies whether ligament damage precedes muscle weakness or follows muscle weakness as a result of PTTD. In subjects with PTTD, MRI studies document high signal intensity, suggesting damage, in the spring ligament, deltoid ligament and interosseous talonavicular ligaments.31,43 Interestingly, the plantar fascia is less commonly involved31 which indicates the windlass mechanism may still function to raise the arch of the foot. The influence of the loss of ligament integrity on muscle function is evident from studies of induced flatfoot. Niki et al38 tested the ability of the posterior tibialis muscle to raise the medial longitudinal arch before and after inducing flatfoot. After flatfoot was induced, the posterior tibialis muscle was less effective at raising the medial longitudinal arch. Similarly, the posterior tibialis demonstrates higher metabolic activity when asymptomatic subjects with pes planus wear orthotics during exercise than when they do not wear orthotics.44 These in-vitro and in-vivo studies suggest a link between the posterior tibialis muscle’s effectiveness at raising the medial longitudinal arch and foot alignment. The flatfoot models suggest that as ligament function fails, the posterior tibialis muscle is less effective at raising the medial longitudinal arch. This may occur as a result of a decreased moment arm and/or a change in angle of pull of the muscle, however, this has not been studied. Through friction45,46 or other mechanisms, these alterations in alignment as a result of ligament damage may predispose subjects to PTTD. Whether weakness precedes tendinopathy or vice versa is not clear, however. What is clear from these studies is that ligament damage, and therefore flatfoot deformity, is strongly associated with PTTD. Most studies using multi-segment foot models note that subjects with PTTD walk with abnormal foot kinematics consistent with flatfoot deformity.20,23-27,47,48 Using in-vivo techniques, several recent studies documented kinematic differences between controls and subjects with PTTD.20,23-27,47 Although these in-vivo techniques may not represent movements of individual joints (e.g., talonavicular joint), studies suggest these models can be accurate for estimates of muscle length and some individual bone motions.28,29,49 In general, these in-vivo foot models provide a gross measure of relative forefoot (metatarsals) and hindfoot (calcaneus) movements. These limitations notwithstanding, in-vivo recordings show that subjects with PTTD walk with greater hindfoot eversion, forefoot dorsiflexion and forefoot abduction during stance phase than controls do.20,23-27,47 This dynamic posture generally matches the flatfoot deformity that is described from static weight bearing measurements.4,16 However, some differences are only apparent during an analysis of walking. forefoot at the transition from stance to swing leads to an exaggeration of forefoot abduction by approximately 10º to 15º.25,26 Therefore, while sagittal plane forefoot dorsiflexion/plantarflexion follows the overall pattern of the controls but is just offset toward greater dorsiflexion, the transverse plane forefoot pattern is not simply an offset in kinematic pattern. The consistency of this observation may depend on severity of foot deformity. Nevertheless, this discrepancy may indicate independent movement of the forefoot and hindfoot in the transverse plane. To understand abnormal kinematics of the foot, proposed locking mechanisms within the foot are important to understand. Studies note that hindfoot inversion, induced by the posterior tibialis and other subtalar inverters, is thought to lock the midfoot (i.e., talonavicualar and calcaneocuboid joints) to stiffen the foot to handle the plantar flexor force after heel off.50 When the locking mechanism is tested in a cadaver model, hindfoot inversion limits sagittal plane forefoot motion (plantar flexion/dorsiflexion) but has minimal effect on transverse (abduction/ adduction) or frontal plane (internal/external rotation) forefoot motion.51 This in-vitro study suggests increased stiffness of the midfoot in the sagittal plane but not the transverse plane.51 Current in-vivo data of subjects with PTTD walking demonstrate greater eversion across stance compared to controls.23,25,26,48 These in-vivo data support the concept of some independence of forefoot and hindfoot movement in the frontal plane. In healthy controls, a recent study using in-vivo foot modeling also noted patterns that do not match the proposed coupling patterns.52 This independence is a key finding of the in-vivo foot data, which suggests that treatments directed at controlling hindfoot eversion alone may not limit forefoot movement. 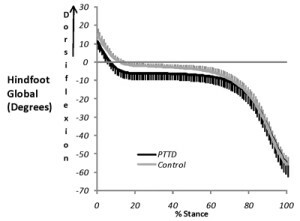 Recent studies suggest bracing may be an effective management strategy for subjects with PTTD, but are not supported by studies of their effects on foot movement. Several studies have examined the outcomes of orthotics, braces, and physical therapy treatment for subjects with PTTD.6-8,13 Examples include a prospective single cohort study using a custom-molded leather and polypropylene AFO.6 Subjects utilizing this brace were successful in relieving pain in 90% of patients after 12 months; however, when used clinically the brace can be cumbersome and is expensive.6 Chao et al8 reported that 33 out of 49 subjects showed improvement in pain, limp, ambulation, and the use of assistive devices using either a medial posted shoe insert or molded ankle foot orthotic. More recently, Lin et al9 reported a 60% rate of satisfaction at 7-10 year follow up in subjects with PTTD who had been treated with a double upright ankle foot orthosis. Bracing in conjunction with physical therapy has also been found to be effective (in terms of subjective and functional outcomes) in 83% of patients with stages I and II PTTD.5 None of these studies evaluated the influence of these various modalities on foot kinematics. Recent studies are examining the influence of various brace designs on the abnormal movement associated with PTTD.53 An off the shelf brace was determined to be efficacious for controlling hindfoot movement consistently across subjects, but was less reliable for forefoot transverse and sagittal plane movements.53 The kinematics of two out of 10 subjects showed exaggerated forefoot abduction or dorsiflexion. In one of those two cases, the fit of the device was poor, and in the second case, the severity of the foot deformity was advanced. Further, only small improvements in hindfoot and forefoot angles were noted in the other eight subjects. These results suggests efficacy of the off the shelf device if a small correction in deformity is desired, except when fit is poor and flatfoot deformity is severe. They also indicate that if improving joint angles is important for altering clinical status, further changes in brace design are desirable. A follow up case study compared the effects of two custom and one off the shelf braces on foot kinematics in a subject with severe flatfoot deformity and PTTD.54 It was hypothesized that the custom fit of the solid ankle ankle foot orthosis would lead to the greatest correction of foot deformity. Surprisingly, the custom articulated ankle foot orthosis was superior to a custom solid ankle foot orthosis and an off the shelf design for improving flatfoot kinematics. The hypothesized mechanism of the jointed ankle design focused on the improved function of the plantar flexors and other extrinsic muscles of the foot, while providing support on the plantar aspect of the foot. Allowing the ankle to move was hypothesized to increase extrinsic muscle control of the foot and ankle, which in turn improved foot kinematics. A further benefit of the jointed ankle foot orthosis is that it may minimize weakness of the ankle plantar flexors that may be induced by a solid ankle foot orthosis. No custom or off the shelf inserts were tested in this study because of the severity of the deformity, which the hindfoot control provided by the hinged ankle foot orthosis was believed to address. As more studies like these emerge, continued modifications to brace design and clinical recommendations are expected. Jeff Houck, PT, PhD, is an associate professor in the department of physical therapy at Ithaca College- Rochester Campus, Center for Foot and Ankle Research, Rochester, NY. Christopher G. Neville, PT, MS, is an assistant professor in the department of physical therapy at SUNY Upstate Medical Center, Syracuse, NY. Adolph Flemister, MD, is an associate professor in the department of orthopedic surgery at the University of Rochester Medical Center, Rochester, NY. The authors are grateful for support from the National Institute of Arthritis and Musculoskeletal and Skin Diseases (Grant #: 1R15ARO54507-01A1). The authors would also like to acknowledge the efforts of Candace Nomides, Jen Churey and Kelly Van Vlack who assisted with data processing. 1. Holmes GB Jr, Mann RA. Possible epidemiological factors associated with rupture of the posterior tibial tendon. Foot Ankle 1992;13(2):70-79. 2. Mann RA, Thompson FM. Rupture of the posterior tibial tendon causing flat foot. Surgical treatment. J Bone Joint Surg Am 1985;67(4):556-561. 3. Kohls-Gatzoulis J, Woods B, Angel JC, Singh D. The prevalence of symptomatic posterior tibialis tendon dysfunction in women over the age of 40 in England. Foot Ankle Surg 2009;15(2):75-81. 4. Johnson KA, Strom DE. Tibialis posterior tendon dysfunction. Clin Orthop Relat Res 1989;(239):196-206. 5. Alvarez RG, Marini A, Schmitt C, Saltzman CL. Stage I and II posterior tibial tendon dysfunction treated by a structured nonoperative management protocol: an orthosis and exercise program. Foot Ankle Int 2006;27(1):2-8. 6. Augustin JF, Lin SS, Berberian WS, Johnson JE. Nonoperative treatment of adult acquired flat foot with the Arizona brace. Foot Ankle Clin 2003;8(3): 491-502. 7. Bek N, Oznur A, Kavlak Y, Uygur F. The effect of orthotic treatment of posterior tibial tendon insufficiency on pain and disability. The Pain Clinic 2003;15(3):345-350. 8. Chao W, Wapner KL, Lee TH, et al. Nonoperative management of posterior tibial tendon dysfunction. Foot Ankle Int 1996;17(12):736-741. 9. Lin JL, Balbas J, Richardson EG. Results of non-surgical treatment of stage II posterior tibial tendon dysfunction: a 7- to 10-year followup. Foot Ankle Int 2008;29(8):781-786. 10. Kulig K. Reischl SF, Pomrantz AB, et al. Nonsurgical management of posterior tibial tendon dysfunction with orthoses and resistive exercise: a randomized controlled trial. Phys Ther 2009;89(1):26-37. 11. Myerson MS, Badekas A, Schon LC. Treatment of stage II posterior tibial tendon deficiency with flexor digitorum longus tendon transfer and calcaneal osteotomy. Foot Ankle Int 2004;25(7):445-450. 12. Marks RM, Long JT, Ness ME, et al. Surgical reconstruction of posterior tibial tendon dysfunction: prospective comparison of flexor digitorum longus substitution combined with lateral column lengthening or medial displacement calcaneal osteotomy. Gait Posture 2009;29(1):17-22. 13. Neville CG, Houck JR, Flemister AS. Science behind the use of orthotic devices to manage posterior tibial tendon dysfunction. Techniques in Foot & Ankle Surgery 2008;7(2):125-133. 14. Myerson MS. Adult acquired flatfoot deformity: treatment of dysfunction of the posterior tibial tendon. Instr Course Lect 1997;46:393-405. 15. Lee MS, Vanore JV, Thomas JL, et al. Diagnosis and treatment of adult flatfoot. J Foot Ankle Surg 2005;44(2):78-113. 16. Bluman EM, Title CI, Myerson MS. Posterior tibial tendon rupture: a refined classification system. Foot Ankle Clin 2007;12(2): 233-249. 17. Houck JR, Tome JM, Nawoczenski DA. Subtalar neutral position as an offset for a kinematic model of the foot during walking. Gait Posture 2008;28(1):29-37. 18. Kidder SM, Abuzzahab FS Jr, Harris GF, Johnson JE. 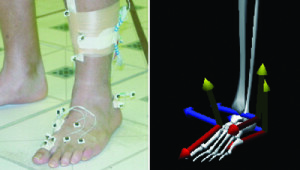 A system for the analysis of foot and ankle kinematics during gait. IEEE Trans Rehabil Eng 1996;4(1):25-32. 19. Leardini A, Benedetti MG, Berti L, et al. Rear-foot, mid-foot and fore-foot motion during the stance phase of gait. Gait Posture 2007;25(3):453-462. 20. Ringleb SI, Kavros SJ, Kotajarvi BR, et al. Changes in gait associated with acute stage II posterior tibial tendon dysfunction. Gait Posture 2007;25(4):555-564. 21. Carson MC, Harrington ME, Thompson N, et al. Kinematic analysis of a multi-segment foot model for research and clinical applications: a repeatability analysis. J Biomech 2001;34(10):1299-307. 22. Hunt AE, Smith RM. Mechanics and control of the flat versus normal foot during the stance phase of walking. Clin Biomech 2004;19(4):391-397. 23. Houck JR, Neville CG, Tome J, Flemister AS. 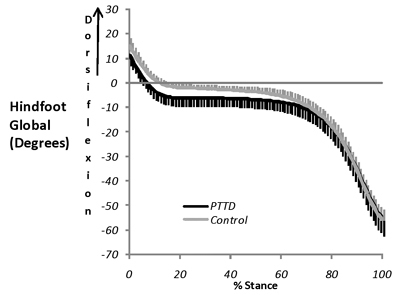 Ankle and foot kinematics associated with stage II PTTD during stance. Foot Ankle Int 2009;30(6):530-539. 24. Johnson J, Harris G. Pathomechanics of posterior tibial tendon insufficiency. Foot Ankle Clin 1997;2(2):227-239. 25. Ness ME, Long J, Marks R, Harris G. Foot and ankle kinematics in patients with posterior tibial tendon dysfunction. Gait Posture 2008;27(2):331-339. 26. Tome J, Nawoczenski DA, Flemister A, Houck J. Comparison of foot kinematics between subjects with posterior tibial tendon dysfunction and healthy controls. J Orthop Sports Phys Ther 2006;36(9):635-644. 27. Rattanaprasert U, Smith R, Sullivan M, Gilleard W. Three-dimensional kinematics of the forefoot, rearfoot, and leg without the function of tibialis posterior in comparison with normals during stance phase of walking. Clin Biomech 1999;14(1):14-23. 28. Nester C, Jones RK, Liu A, et al. Foot kinematics during walking measured using bone and surface mounted markers. J Biomech 2007;40(15):3412-3423. 29. Westblad P, Hashimoto T, Winson I, et al. Differences in ankle-joint complex motion during the stance phase of walking as measured by superficial and bone-anchored markers. Foot Ankle Int 2002;23(9):856-863. 30. Liu W, Siegler S, Hillstrom H, Whitney K. Three-dimensional, six-degrees-of-freedom kinematics of the human hindfoot during the stance phase of level walking. Hum Mov Sci 1997;16(2-3):283-298. 31. Deland JT, de Asla RJ, Sung IH, et al. Posterior tibial tendon insufficiency: which ligaments are involved? Foot Ankle Int 2005;26(6):427-435. 32. Chen YJ, Liang SC. Diagnostic efficacy of ultrasonography in stage I posterior tibial tendon dysfunction: sonographic-surgical correlation. J Ultrasound Med 1997;16(6):417-423. 33. Mosier SM, Lucas DR, Pomeroy G, et al. Pathology of the posterior tibial tendon in posterior tibial tendon insufficiency. Foot Ankle Int 1998;19(8):520-524. 34. Conti S, Michelson J, Jahss M. Clinical significance of magnetic resonance imaging in preoperative planning for reconstruction of posterior tibial tendon ruptures. Foot Ankle 1992;13(4):208-214. 35. Wacker J, Calder JD, Engstrom CM, Saxby TX. MR morphometry of posterior tibialis muscle in adult acquired flat foot. Foot Ankle Int 2003;24(4):354-347. 36. Flemister AS, Neville CG, Houck J. The relationship between ankle, hindfoot, and forefoot position and posterior tibial muscle excursion. Foot Ankle Int 2007;28(4):448-455. 37. Klein P, Mattys S, Rooze M. Moment arm length variations of selected muscles acting on talocrural and subtalar joints during movement: an in vitro study. J Biomech 1996;29(1):21-30. 38. Niki H, Ching RP, Kiser P, Sangeorzan BJ. The effect of posterior tibial tendon dysfunction on hindfoot kinematics. Foot Ankle Int 2001;22(4):292-300. 39. Thordarson DB, Schmotzer H, Chon J, Peters J. Dynamic support of the human longitudinal arch. A biomechanical evaluation. Clin Orthop Relat Res 1995;(316):165-172. 40. Houck JR, Nomides C, Neville CG, et al. The effect of Stage II posterior tibial tendon dysfunction on deep compartment muscle strength: a new strength test. Foot Ankle Int 2008;29(9):895-902. 41. Kulig, K, Burnfield JM, Requejo SM, et al. Selective activation of tibialis posterior: evaluation by magnetic resonance imaging. Med Sci Sports Exerc 2004;36(5):862-867. 42. Sharkey NA, Donahue SW, Ferris L. Biomechanical consequences of plantar fascial release or rupture during gait. Part II: alterations in forefoot loading. Foot Ankle Int 1999;20(2):86-96. 43. Gazdag AR, Cracchiolo A 3rd. Rupture of the posterior tibial tendon. Evaluation of injury of the spring ligament and clinical assessment of tendon transfer and ligament repair. J Bone Joint Surg Am 1997;79(5):675-681. 44. Kulig K, Burnfield JM, Reischl S, et al. Effect of foot orthoses on tibialis posterior activation in persons with pes planus. Med Sci Sports Exerc 2005;37(1):24-29. 45. Arai K, Ringleb SI, Zhao KD, et al. The effect of flatfoot deformity and tendon loading on the work of friction measured in the posterior tibial tendon. Clin Biomech 2007;22(5):592-598. 46. Uchiyama E, Kitaoka HB, Fujii T, et al. Gliding resistance of the posterior tibial tendon. Foot Ankle Int 2006;27(9):723-727. 47. Neville C, Flemister A, Tome, Houck J. Comparison of changes in posterior tibialis muscle length between subjects with posterior tibial tendon dysfunction and healthy controls during walking. J Orthop Sports Phys Ther 2007;37(11):661-669. 48. Houck JR, Neville C, Tome J, Flemister AS. Foot kinematics during a bilateral heel rise test in participants with stage II posterior tibial tendon dysfunction. J Orthop Sports Phys Ther 2009;39(8):593-603. 49. Umberger BR, Nawoczenski DA, Baumhauer JF. Reliability and validity of first metatarsophalangeal joint orientation measured with an electromagnetic tracking device. Clin Biomech 1999;14(1):74-76. 50. Van Boerum DH, Sangeorzan BJ. Biomechanics and pathophysiology of flat foot. Foot Ankle Clin 2003;8(3): 419-430. 51. Blackwood CB, Yuen TJ, Sangeorzan BJ, Ledoux WR. The midtarsal joint locking mechanism. Foot Ankle Int 2005;26(12):1074-1080. 52. Chang R, Van Emmerik R, Hamill J. Quantifying rearfoot-forefoot coordination in human walking. J Biomech 2008;41(14):3101-3105. 53. Neville C, Flemister AS, Houck JR. Effects of the AirLift PTTD brace on foot kinematics in subjects with stage II posterior tibial tendon dysfunction. J Orthop Sports Phys Ther 2009;39(3):201-209. Figure 1. The picture to the left shows the various markers that are placed on the foot to model the foot as separate segments. The animation to the right shows the resulting 3 dimensional coordinate systems that are used to derive in-vivo foot kinematics. Figure 3. The graphs above show the calcaneus segment (A) and 1st Metatarsal (B) segments in the global axes during the stance phase of walking. Grey lines = Controls and Black lines = Posterior Tibial Tendon Dysfunction (PTTD) participants. While the calcaneus plantar flexes, the 1st metatarsal is stationary. In the PTTD subjects the medial longitudinal arch is lowered (shown in red to the left) as a result of higher calcaneal plantar flexion and a position of higher 1st metatarsal dorsiflexion (φ) the medial longitudinal arch lowers.